Portrait of a tattooed male from Nukuhiva (Marquesas Islands) - KRUSENSTERN, A.I. /TILESIUS, W.
Title : Portrait of a tattooed male from Nukuhiva (Marquesas Islands). Map maker : KRUSENSTERN, A.I. /TILESIUS, W.. Date : St. Petersburg, 1813-1814. Size : 24.4 x 18.5 inches. / 62.0 x 47.0 cm. 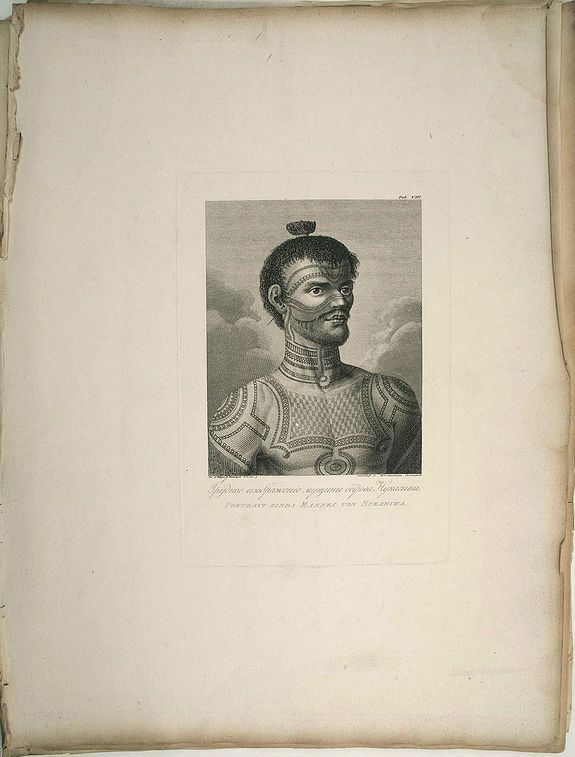 Description :An original plate in imperial folio size, originating from Krusenstern's 1813-14 atlas (Russian & German language) to his voyage around the world: Atlas k puteshestviuu vokrug sveta kapitana Kruzenshtema. This is plate 8 from the atlas and has a caption in Russian and one in German. The latter reads: "Portrait eines Mannes von Nukuhiwa". Krusenstern's plates of his short stay at NukuHiva, Marquesas Islands have become archetypal images in the history of Pacific exploration. The striking plates of tattooed men from the Island illustrate Europe's fascination with this newly discovered world. An additional chapter in Krusenstern' s account, written by Langsdorff, specifically focused on the art of tattooing. Adam Ivan (or Johann) von Krusenstern led the famous first Russian circumnavigation between 1803 and 1806 . The voyage was one of the most important post-Cook Pacific voyages, specifically aimed at obtaining more knowledge about the North-Pacific region. The naturalist aboard the voyage was Wilhelm Gottfried Tilesius from Leipzig. He was responsible for making the drawings and paintings - both ethnographical and zoological. Krusenstern's account of the voyage was first published in Russian in St. Petersburg, and followed by German, French and English editions. In 1813-14 a huge two-volume folio atlas of the voyage was published in St. Petersburg, containing 104 maps and plates after drawings by Tilesius, with text in Russian and German. This atlas is extremely rare and one of the most sought after Pacificana collectibles today. References for the entire atlas: Lada-Mocarski 62;. Sabin 38327; Arctic Bibliography 9377; Forbes Hawaii 401. Forbes writes about the atlas: "as beautiful as it is rare"
Condition : Very good condition, printed on thick paper, light damp-stain on top right corner well away from image, margins a little frayed.